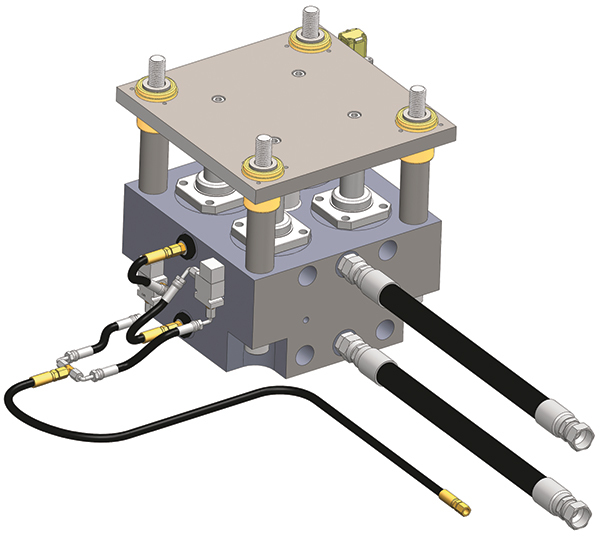 This illustration depicts a servo-controlled hydraulic cushion with double-acting cylinders, linear transducers and pressure transducers. The unit can be stud-mounted to the bottom of a press bolster. A decade after arriving on North American shores, servo-drive mechanical presses truly are taking over. Automotive OEMs are installing the machines in plants across the land, with their tier suppliers, and even job shops, following suit. To complement servo presses, manufacturers have unveiled servo-controlled cushions. The cushions provide flexibility and controllability, allowing metalformers to dial-in and fluctuate pressure on downstrokes and upstrokes, thus aiding in precision forming and drawing while nearly eliminating the evils of reverse tonnage. New hydraulic cushions employing servo control have already entered the field. Servo-controlled hydraulic cushions offer this and other benefits in response to metalforming trends. A screenshot from a press-cushion control panel shows how operators and management can monitor and control cushion functions to best assist the press during part forming. As more metalforming companies embrace lean manufacturing, so too have needs increased for more efficient tooling, presses, cushions and force generation. Waste elimination is another major goal. Stamped-parts producers task their engineers to reduce blank sizes to combat scrap generation. Bringing more control into the stamping process through the use of a servo press and accompanying cushion, and their combination of variable high and low forces and speeds, can eliminate the need for draw beads, resulting in reduced blank sizes, according to Hyson officials. That feature can enable forming without draw beads. This graph displays the force of a servo-controlled hydraulic press cushion as well as a position curve. Note how the cushion ramps up force at the bottom of the stroke to ease shock on the part, tooling and press. Forming advanced high-strength steel (AHSS) requires increased press energy and higher cushion tonnages. 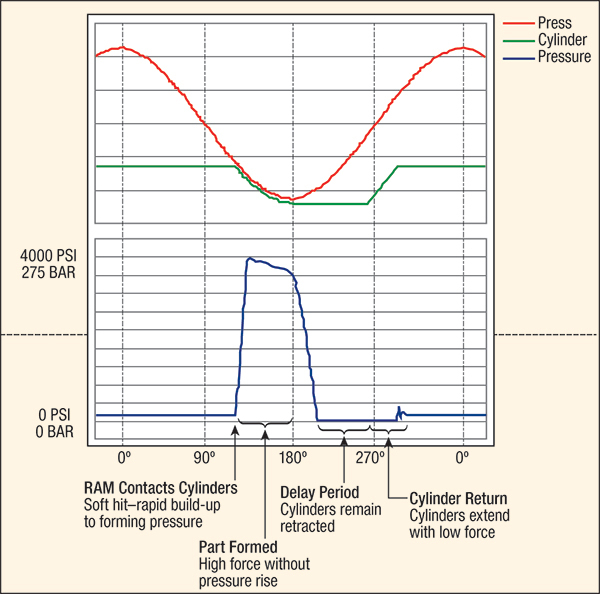 Nitrogen cushions ramp up process force using pressures surpassing 2000 psi, according to Quander Jr. However, hydraulic cushions operate at pressures greater than 4000 psi, with the added benefit of delaying or eliminating reverse tonnage. “While air and even nitrogen no longer suffice with the pressures used for forming AHSS,” he says, “servo-controlled hydraulic cushions provide much more force. That force, in traditional systems, has a drawback: reverse tonnage. However, this cushion technology delays that force and controls the return, eliminating the tonnage spike that ordinarily would filter back through the press. In essence, the cushion matches the speed of the press and dissipates the force to eliminate reverse tonnage, reining in that force to enable stamping of more precise parts. The advent of servo-controlled hydraulic cushions also provides for increased productivity and greater part complexity, according to the Hyson team. Servo-Controlled Hydraulic Cushions• Adjustable/programmable force profile—Force can be controlled and programmed throughout the stroke. • Pre-acceleration—This capability allows the cushion to start moving (pre-accelerating) in order to minimize impact load. • Delay function—The system can delay at the bottom of the stroke to reduce reverse tonnage into the part and press. • Standalone force—Variable forming force can be applied as the ram remains stationary. The technology ultimately allows for increased production, as Reilly explains. New technology often comes with a dreaded steep learning curve and apprehension about its incorporation. To address those issues, stampers will want to look for servo-controlled hydraulic cushions with their own interfaces and touchscreen controls, independent of press controls. This standalone design eliminates difficulties in tying in with press controls. The cushions can be run by remote LCD control panels that operate via local or plant WiFi.